In a letter to developers on Tuesday, Apple requested app submissions for its upcoming OS X 10.10 Yosemite launch, noting software built with the Swift programming language can be submitted to the Mac App Store via the latest Xcode 6.1 golden master seed. In the note, Apple also touts OS X Yosemite features like app extensions and the Swift programming language first unveiled at WWDC in June, urging developers to take advantage of new technologies built in to the OS. Developers can download the Yosemite GM and Xcode 6.1 GM from the company's Developer Portal to start building —or modifying —apps for distribution. Apple also notes Swift has been finalized as of the latest Xcode release and invites app submissions using the new coding language. 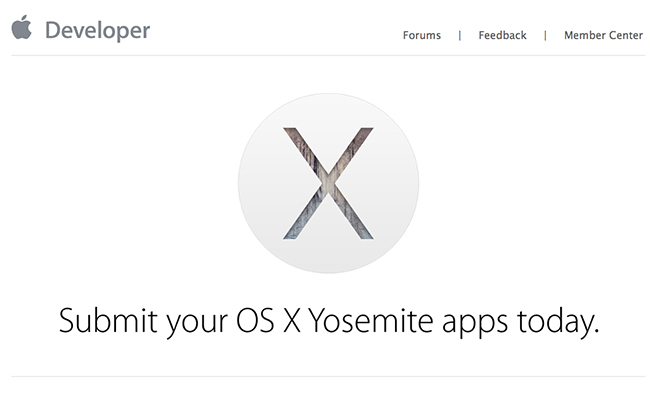 Apple is expected to launch OS X 10.10 Yosemite in October, but a firm release date has yet to be announced.